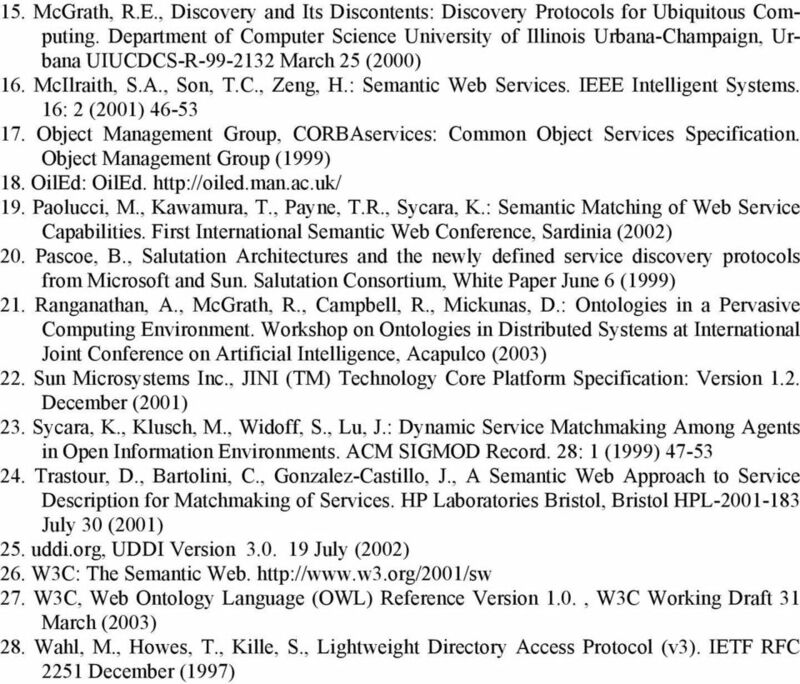 Download "Incorporating Semantic Discovery into a Ubiquitous Computing Infrastructure"
2 covery: it must be possible to discover all and only the relevant entities, without knowing in advance what will be relevant. This process has also been termed matchmaking [1, 10, 15, 19, 23, 24]. We believe that semantic discovery will be one of the fundamental protocols of a Ubiquitous Computing Environment. 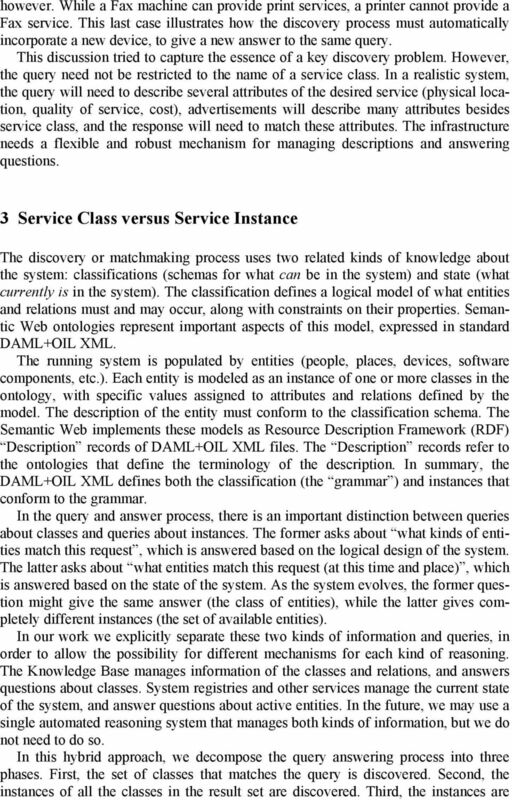 The semantic discovery service will implement semantic queries that seek to match conceptually equivalent concepts: entities that may have different values describing equivalent concepts (i.e., different terminologies). Answering semantic queries requires some form of knowledge representation, automated reasoning, and question answering. 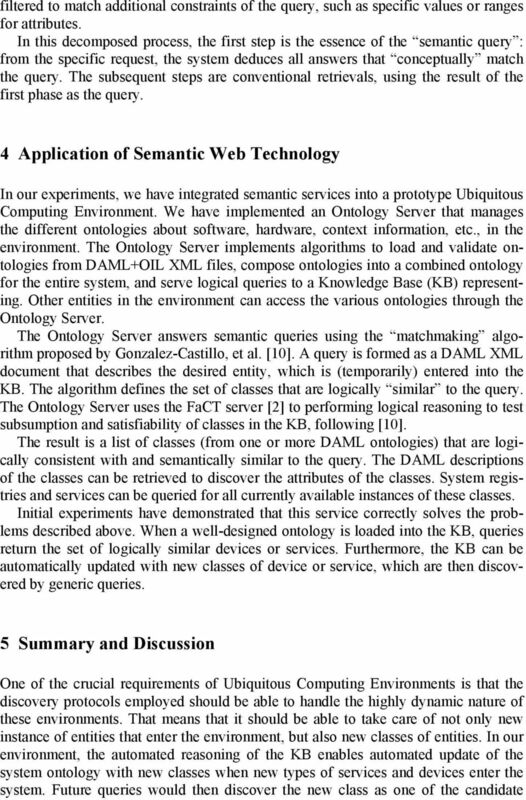 In this paper, we discuss our prototype implementation of semantic queries in a Ubiquitous Computing Enviro In onment. ur experimental implementation, the semantic queries are implemented by queries to a Knowledge Base (KB), which contains descriptions of classes and relationships. A class could represent any concept that is used in a Ubiquitous Computing Environment. A class could be an entity (an application, a service, or a person), context information (location, activity, or temperature) or any a physical or virtual concept (chairs, tables, data files, or network connectivity). We decompose the process of semantic discovery into three phases: 1. Discovery of all the classes that match (i.e. are logically related to) a query 2. Discovery of all the instances of these classes 3. Filtering the instances to match the exact query In this paper, we focus on the first step, which is the essential semantic query. The second and third steps are conventional retrievals from registries or databases. The Semantic Web is evolving to address this problem for Web Services [3, 26]. 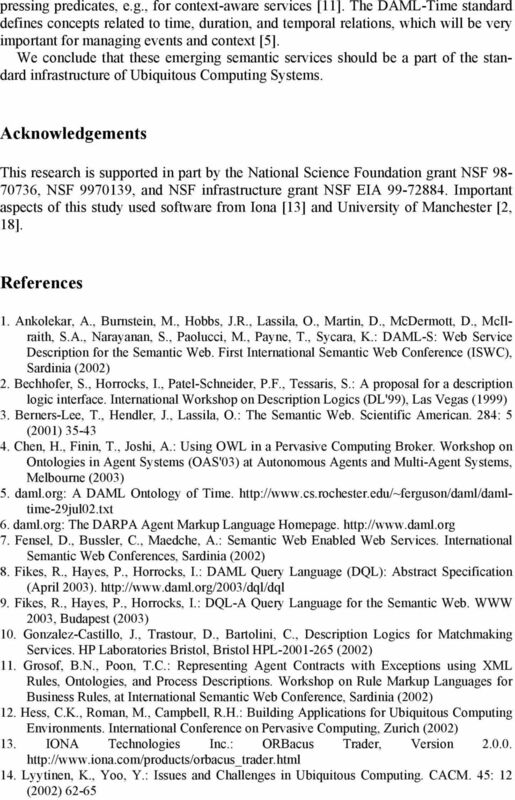 The DAML+OIL XML language  1 is being extended to enable semantic discovery and matchmaking [1, 7, 16, 19]. This technology is now being applied to Pervasive and Ubiquitous Computing Environments (e.g., [4, 21]). 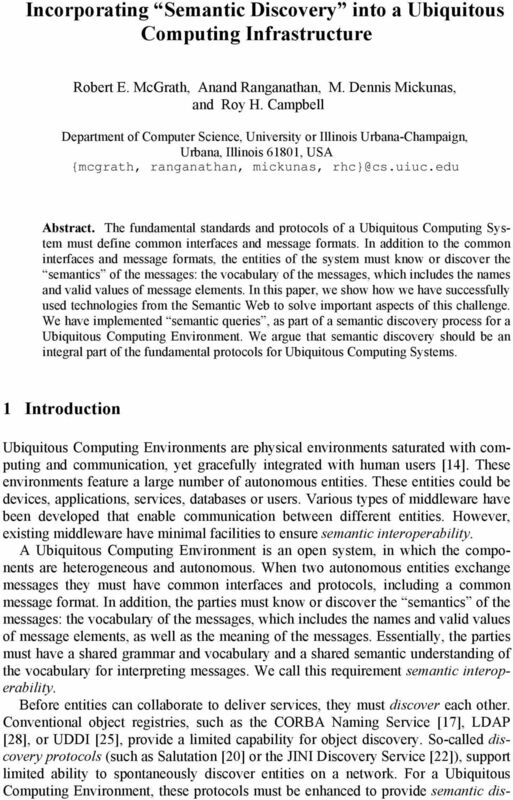 The main contribution of this paper is that we show why semantic queries should form an integral part of the fundamental protocols for Ubiquitous Computing Systems. We also describe our infrastructure for enabling the answering of semantic queries. 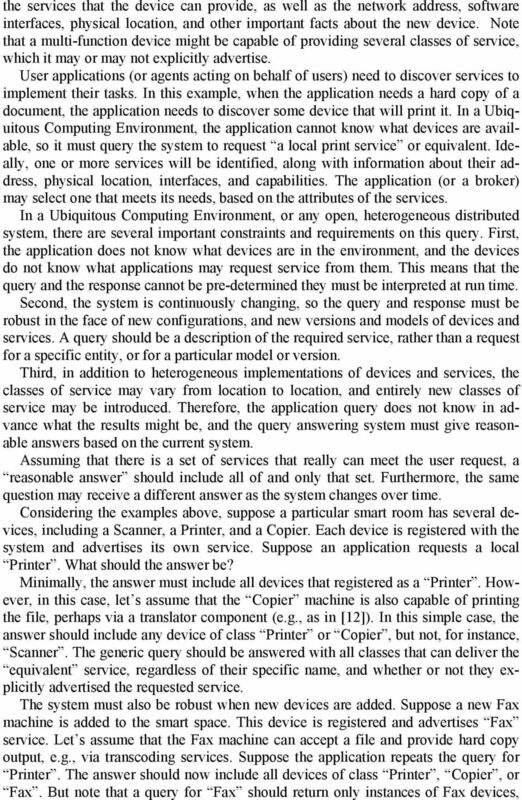 2 An Example Problem: Discovering a Service in a Ubiquitous Computing Environment In order to illustrate and motivate the discussion, this section presents a Ubiquitous Computing scenario that involves searching for print services. Imagine a Ubiquitous Computing Environment, in which a variety of network attached devices are present. Some of the devices provide I/O capabilities, including hard copy output and hard copy input (e.g., imaging and scanning). Different classes of devices provide alternative, but possibly overlapping, classes of service. When a device is introduced into the system, it will automatically register with the infrastructure so that applications and users can use it. 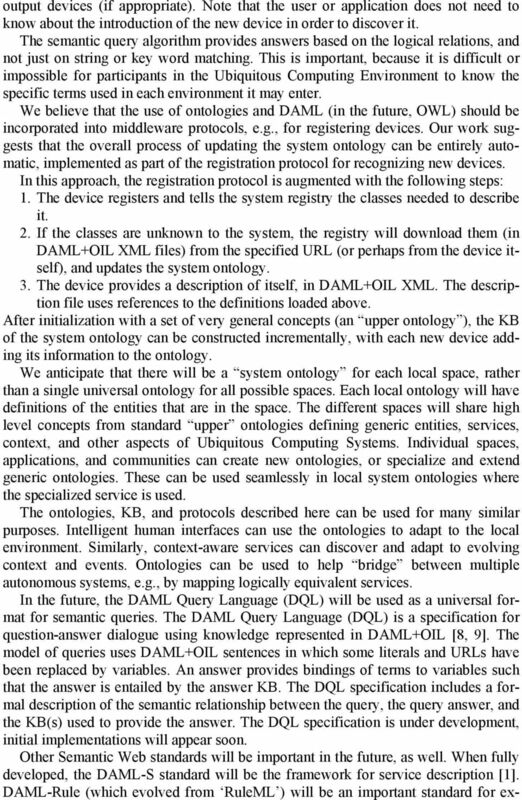 The registration will advertise 1 The DAML+OIL language is now being standardized as the Web Ontology Language (OWL) . This paper refers to DAML+OIL, but it should be understood that OWL will be used in the future. Proposal of an Architecture to Retrieve Information from Multiple Devices using Matchmaking Algorithms J. Javier Samper Vicente R. Tomás R. P. do Nascimento Juan J. Martínez Computer Science Department. CHAPTER 1 INTRODUCTION 1.1 Introduction Service Discovery Protocols (SDPs) are network protocols which allow automatic detection of devices and services offered by these devices on a computer network . Web services and Software agents F. Dignum Utrecht University Contents What are Web Services? Standards Problems with Web Services Software Agents Conclusions Today s Web Web Services: Killer Application? ODE-SWS: A Semantic Web Service Development Environment Óscar Corcho 1, Asunción Gómez-Pérez 1, and Mariano Fernández-López 1 Manuel Lama 2 1 Departamento de Inteligencia Artificial. Facultad de Informática.